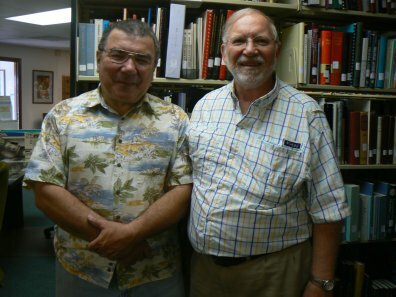 While in the Denver area for the Rocky Mountain Stamp Show earlier this month I was able to make visit to the Rocky Mountain Philatelic Library (RMPL). RMPL President Sergio Lugo was kind enough to giveme a thorough tour of the library complex which consists of two buildings and an outdoor garden. I visited the library a couple of years ago and I was amazed at how much progress they have made in achieving their vision for the future of the library. When I visited last they had just purchased a building adjacent to their original building. Although there is work still to be done, the newly purchased building has been substantially remodeled. A large meeting room is regularly in use by RMPL and area philatelic organizations. On my recent visit to the library the Scandinavian Collectors Club was there for a major seminar in conjunction with the Stamp Show. On the lower level of the new building several small alcoves have been created for specialty stamp organizations. The Henry Hahn Memorial Library of the Society for Czechoslovak Philately has already taken residence in one of these alcoves. One of the most unusual aspects of the RMPL complex is an outdoor garden that has been established on vacant land which came with the new building. It is quite impressive. Thanks to Sergio and all of the nice folks at RMPL who made my visit a great treat. I will be adding a few more posts about my RMPL visit in the future.